Papay is somewhere you can happily spend a day or a lifetime. If you think it just merits a day trip, do be prepared to conclude that you'll have to come back again soon. With the good transport links and excellent accommodation on the island, you can always explore on your own. However, Papay Wildlife Club holidays now offer a wonderful all-inclusive experience, for those wanting a short break enjoying the island's wildlife, along with a dash of its archaeology along with the hospitality for which the island is famed. If you want to get the most out of a single day here, you can't do better than going on a Papay Peedie tour. It is possible to walk virtually anywhere on Papay - make sure you have your binoculars and camera with you as you never know what interesting wildlife you may encounter. You can also hire bicycles. Explore Papa Westray's rich local history and enjoy films, audio recordings, photos, books, information and events in our modern heritage, art & craft centre. Refurbished in 2016, The Kelp Store is great source of local archive information as well as a venue for the OY Arts Festival and many other local arts, crafts, music and cultural activities. Open 7 days a week, entry is by donation towards the cost of maintaining this historic community building. The Kelp Store is available to hire for workshops, events, concerts and special occasions - for more information about the Kelp Store contact Papay Development Trust via Jennifer email cdopapay@gmail.com or The Kelp Store / Papay Ranger Facebook pages. This was last used for milling oats about 100 years ago. Remains of the undershot wheel and millstones can still be seen. Formerly the home of the Traill family, owners of the isle for three centuries, it is perhaps the most extensive traditional steading in Orkney. It features a doo'cot, mill tramp and corn drying kiln. Step back in time when you visit the Bothy. The steamer called here once a week before the New Pier was built in 1970. Years before it was used by local traders using sailing vessels such as the Lebanon. 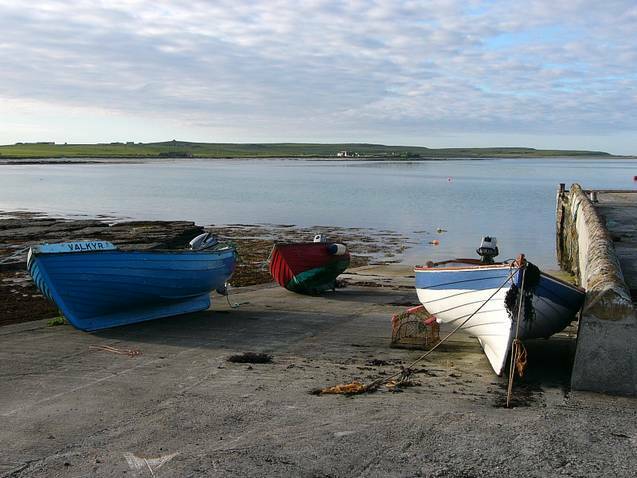 Nowadays it is used by local lobster boats and for access to the Holm of Papay. Visit the sandy beaches of Bothican or North and South Wick. Anywhere along the shore you can see seals and a huge variety of birds. At Cott and Nouster you can find excellent examples of boat nausts. A community coffee morning is held every Wednesday from 10.30-11.45am in St Ann's Community Room, providing a great opportunity to enjoy fresh coffee, tea and homebakes for locals and visitors alike. A weekly 'pub' is available at Beltane House on a Saturday night from 8pm offering locals and visitors a chance to meet socially. Check the shop notice board for details. Events such as dances, games nights and film nights are held throughout the year and information on local events can be found on the Papa Westray Facebook page, at the Papay Community Shop or by contacting Tim on (+44) 01857 644224, e-mail tim@timdodman.co.uk. The Papay Fun Weekend is held normally during the third weekend in July - in 2018 it will be on the 20th-22nd July - and includes a barbeque and ceilidh, family games and races, a traditional dance and a 'carty race' down the New Hooses Brae (feel free to bring along your own homemade carty for the race!). With everything from sand sculpture competitions to tug o' war it makes for a great weekend of fun. See our Island Events page and the Papa Westray Noticeboard for more details. As well as great beaches and wide open spaces, Papay has a variety of other play opportunities for families and children of all ages. The well-equipped play area next to the community school offers adventure play for children from 1-14 years with swings, climbing frame, spiral slide, roundabout and playhouse. For those visiting with bikes, the Cyclogym located in front of the school and kirk provides a challenging bike course for cyclists of all ages including a pyramid, a rattle bridge and a see-saw ramp, to test your cycling skills. Out of school hours, the football pitch is a popular choice for locals and there is always a ball left by the goalposts for a spontaneous kick-around. 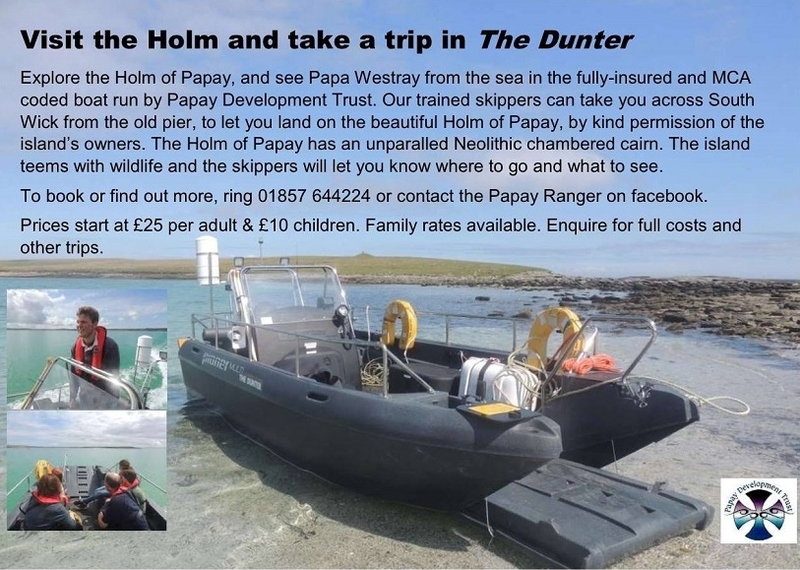 Papay also has a 9-hole golf course near the new pier at Moclett and you can either play using your own clubs, teeing-off from the first hole by the club house (green wooden hut on the links) or contact Alistair on tel: (+44) 01857 644238 to hire clubs. St Ann's Church - St Ann's Kirk has the distinction of being the first kirk in Scotland to be given by the proprietor to the Free Church following the Disruption of 1843. The laird, George Traill, funded the new kirk and it was handed over to the General Assembly of the Free Church in 1844 by his daughter Ann. Thus the church, unusually, was dedicated to Ann Traill, not Saint Ann. In 1929 the congregations of St Boniface and St Ann's joined, St Ann's becoming the Parish Kirk attended by the minister for Westray and Papa Westray. Services are held weekly. All welcome. Gospel Hall - Holds weekly Sunday services. All welcome.